The Spanish transition from dictatorship to democracy took place under the dominion of the conservative forces that controlled the apparatus of the fascist state from 1939 – 1978. The leadership of the democratic forces had just come out of jail or returned to Spain from exile and could not match the enormous powers that the ultra-right had in the political institutions and in the media where their control was almost absolute. The workers’ mobilization against the dictatorship had been instrumental in ending that dictatorship. From 1974 to 1976, Spain saw the largest number of strikes that existed in Europe, strikes aimed at ending the dictatorship. Franco died in bed but the dictatorship ended in the streets, with workers’ mobilizations. That popular pressure was able to modify but not break, however, the apparatus of the dictatorial state. The enormous power of the ultra-conservatives forces and the weakness of the political leadership of the left-leaning democratic movement prevented the establishment of a full democracy and, as a consequence, those conservative forces maintained an enormous influence in the political and cultural lives of Spain. That explains the difficulties that the progressive forces in Spain have had in correcting the official history promoted by the post-Francoist conservative forces in the country. One example of this inability to change the “official” history is how Dali is presented to the public. There is a whole industry aimed at promoting his paintings and his life. And Dali is a major figure celebrated in Spain. Recently, the major opera house of Barcelona – el Liceu – showed an opera dedicated to Dali. And Cadaques, one of the places on the Mediterranean Catalan coast where the Catalan bourgeoisie spends their vacations, has a monument in the major square of the town with his figure. Dali was, however, a person with clear fascist positions. The media has kept a complicit silence about it. On the rare occasions that politics appear in the official biography of Dali, his support for the dictatorship is explained as his intent to be on good terms with the apparatus of that state in order to avoid paying taxes, a perception usually held in Catalonia and Spain, where tax fraud has always been a general practice among the wealthy. This collaboration with the dictatorship is trivialized because in the community of the rich (among which Dali was a prominent figure) everyone practiced tax fraud. Except for this piece of information which usually appeared as a footnote, nothing is said about Dali’s heavy involvement with fascism. This is how the dominance of conservative forces appears in the shaping of perception in the art world. The equivalent of this situation in the United States would be if Washington’s Kennedy Center were to dedicate an entire musical to the figure of Ezra Pound, the American supporter of Mussolini, who has properly been ostracized in the writers community of the US. In his detailed and excellent book on Dali, Ian Gibson has documented Dali’s identification with fascism in Spain from the very beginning. (The Shameful Life of Salvador Dali. Faber and Faber, 1997). During the civil war, Dali never came out in support of the Republic. He did not collaborate, for example, in the Paris Fair in 1937, where Picasso presented his Guernica, aimed at raising funds for the Republican cause. And he soon made explicit his sympathies for the fascist coup of 1936 and for the dictatorship that it established in a letter to Buñuel, a well-known filmmaker in Spain. He made explicit and known his admiration for the figure and writing of the founder of the Spanish fascist party (La Falange), José Antonio Primo de Rivera, and used in his speeches and writings the fascist narrative and expressions (such as the fascist call “Arriba España”), referring to the special role Spain had in promoting the imperial dreams over other nations. He sympathized with the anti-Semitic views of Hitler and celebrated Franco’s alliance with Hitler and Mussolini against France, Great Britain and the United States. He also welcomed the “solution to the national problem” in vogue in Nazi and fascist circles at that time. Dali became the major defender of the Franco dictatorship in the artistic world. He was also, as Spanish fascism was, very close to the Church and to the Vatican of Pope Pius XII, indicating that modern art needed to be based on Christianity. His loyalty to the fascist dictatorship continued to the very end, defending the state terrorist policies that included political assassinations, even in the last moments of that dictatorship. A few months before dying, Franco signed death warrants of five political prisoners, which created an international uproar of protest. Dali defended Franco’s execution orders, indicating that many more death sentences should have been signed by the generalissimo, to whom he referred as “the greatest hero of Spain”. Franco is the Spanish figure who has killed more Spaniards in Spanish history, (120,000 of them are still disappeared with no knowledge of where they are buried). All the facts are well documented in Ian Gibson’s book, but rarely, if ever, do they appear in the Spanish press. Actually, La Vanguardia, which belongs to the Godo family, (a major supporter of the fascist coup and which used to be the major defender of the Spanish dictatorship and now has become the major conservative paper of Catalonia), keeps publishing articles about the life of Dali, without ever referring to these events. The popular classes, however, have a memory. Dali was hated by the democratic forces. When Franco died, Dali fled from Cadaques, afraid for his life. In 1976, during the last years of the dictatorship, a bomb was discovered under his usual seat in a major restaurant in Barcelona. And he soon became aware that his life and patrimony could be endangered if the democratic forces were to win. But he underestimated the power of those ultra-conservative forces who were loyal to him. 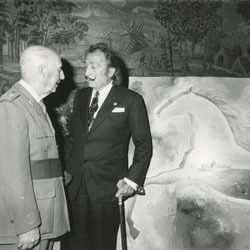 The King, Juan Carlos I, appointed by General Franco, became the head of state and of the armed forces in the newly established democracy and extended his protection to all the major figures of the fascist establishment including Dali. And, a monument with his statue was raised in Cadaques.